Next on our itinerary after the Bangui Windmills visit is the Kapurpurawan Rock Formation. There are many pictures of this famous rock formation but we learned that there was more to it than the single rock you often see in pictures. 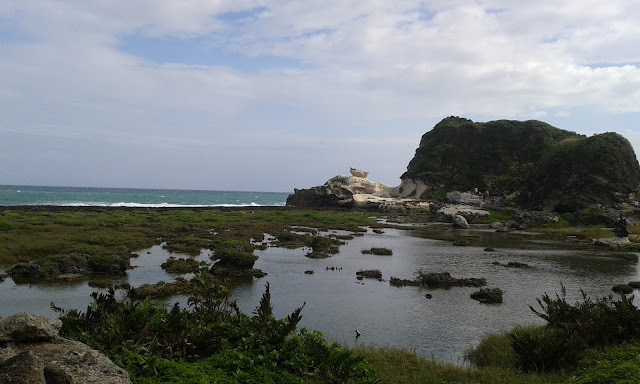 The famous rock formation of Kapurpurawan in Ilocos Norte. Luckily, the slight drizzle had stopped and the sun shone through the clouds. It was the perfect weather to explore our next destination and to take pictures, lots of pictures. Kapurpurawan is located in Burgos, Ilocos Norte. It is easy to find as a sign is clearly visible along the highway. However, it does take some travel time from the entrance to get to the actual location. The rock formation is located near the shore which was quite a walk from the entrance. From a far, it is a very prominent feature of the whole landscape. It was a weekend and so many people were taking their time off to also explore this famous spot. We went along with and through the crowd and got our chance to take pictures. We got to take this picture without any of the crowd. The crowd already taking pictures at one of the statues along the way to the rock formation. The weather was still cold and there was a strong wind. The large number of visitors made it hard to take pictures. When we were able to take pictures, it was hard to make any expressions as the wind whipped our hair and the icy cold breeze made us grimace or frown instead of smile. So not much pictures of us during our Laoag and Pagudpud trip. But the views had all of our attention. A couple of our friends having their picture taken with the rock formation behind them. There were no swimmers on this beach, there were a lot of folks who were riding on horses to explore the shore. We didn't want to use the animals though and opted to walk on our own instead. Strong waves beckoning to the beach-bums in us. Before we reached the famous rock formation, our friends took the opportunity to have their pictures taken with the statue of the local hero, Lam-ang. Our friends taking their turn for picture-taking. Our photographer called out to us and took this shot. The statue commemorates the hero Lam-ang, legendary character of the Ilocano epic poem Biag ni Lam-ang (The Life of Lam-ang). Lam-ang had extraordinary powers as well as magical pets which helped him survive many of his adventures including defeating monsters and even getting resurrected. 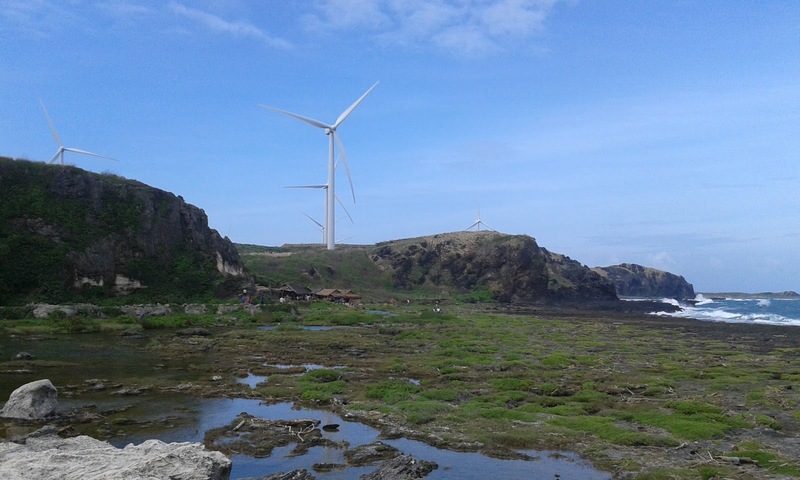 The windmills, the nipa huts, the hill, the sea and waves made a surreal picture for a moment. For a moment this view made me think I wasn't in the Philippines anymore. Our friends tried to take pictures while at the rock formation site but there were too many people around to actually take a decent picture. The only picture I had on that spot was with my friend which also showed how many people were there at the time. The rock formation was creamy white, almost pinkish in color and had a soft, chalk-like texture. I was thankful that most visitors only took pictures and did not try to touch and take souvenirs of the soft rock as well. This rock formation was created by the wind and waves for a very long time into its current shape so it's a good thing that visitors respect it by not touching it. After some futile attempts to get a group picture or pictures of ourselves individually, we instead explored further ahead and found that the famous spot wasn't the only interesting thing in the place. 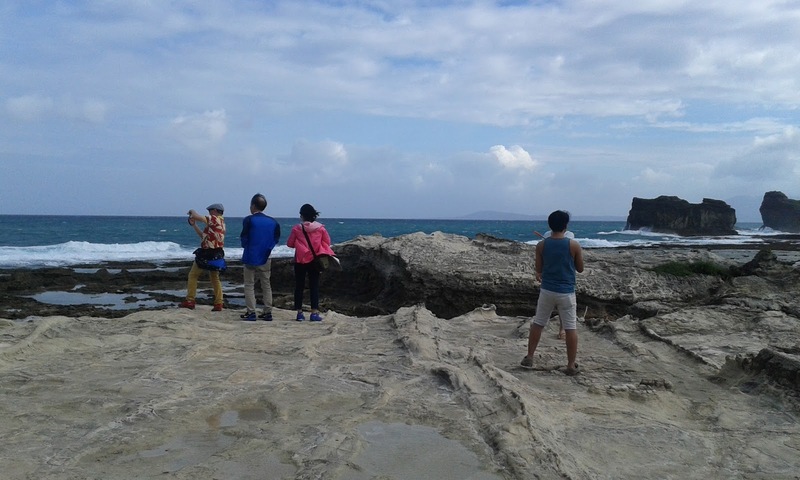 The rock formation was the most prominent feature of the whole landscape but the location behind it provided a breath taking view of the West Philippine Sea. This rocky landscape behind the rock formation offers an awesome view. 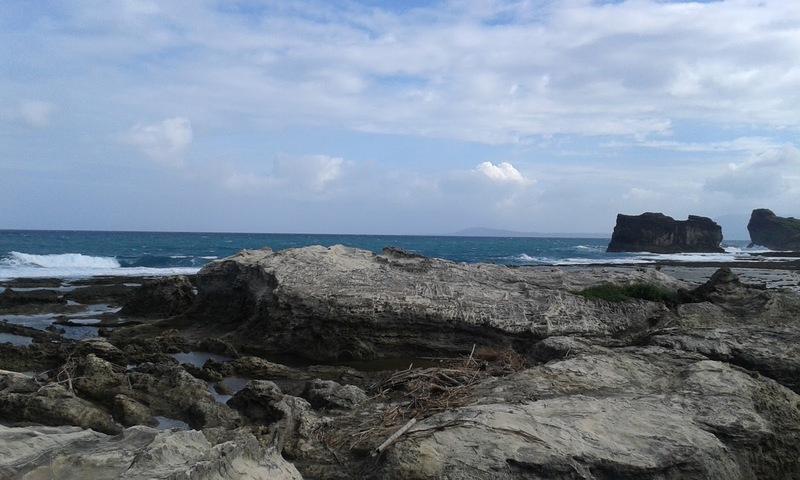 The rocky shore with the waves crashing on them. After battling the harsh wind and icy breeze, we peeled our eyes off the awesome view and started our walk back to the entrance of the site. We took one last look at the rock formation and were on our way to our next destination. Last look at the famous rock formation. I had been to this location twice and it was only on the second visit that I found out about the breath taking view on the other side of the rock formation. So the next time I visit a place, I will definitely try to explore the other parts of a famous landmark and see if there are other interesting things to discover.